I found this recipe here. These were not that hard to make. It sort of reminded me of Crack Chicken Dip. Combine all of the meatball ingredients in a large bowl. The mixture will be very sticky and gooey. Place them on a greased cookie sheet and bake for 10 minutes. While they are baking make the sauce. Combine the Frank's and the butter in a microwave safe bowl and microwave for 2 minutes on high. Then stir. After 10 minutes, remove the meatballs from the oven and dunk carefully into the sauce. I used a spoon to scoop them up and place in the sauce. 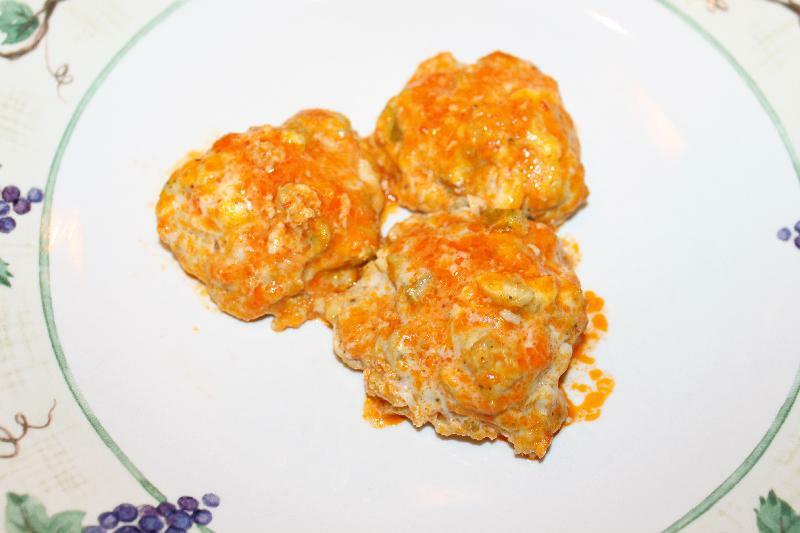 Place each meatball back onto the cookie sheet and bake another 12 minutes. If there is leftover sauce I poured it onto the meatballs for the last 3 minutes of baking. I ate mine with blue cheese dressing.